Simply put, a lift chair lifts and lowers itself in order to make it easier to sit or stand. Anybody who has trouble getting up and out of a chair on their own will benefit greatly from a lift chair. People who sit in their chair for long periods of time will naturally get stiff, making it a challenge to get up. Having a chair that will help a person rise and sit comfortably will put a lot less strain on the back and knees. Lift chairs have come a long way since they first hit the market. The early lift chairs were “spring-loaded” and were deemed unsafe because of the quick jerk they would give while rising. Some people would be thrown with such great force that they would actually fall forward. The scissor lift quickly replaced the “spring-loaded” chairs and uses an electric motor controlled by buttons on the chair. This method of lifting is much safer and works for people of all shapes and sizes. Today there is a wide variety of lift chairs available for people with different needs and preferences. Of course one of the first things to look at when deciding on a chair is the size, but there are other factors such as positioning and levels of recline; each of which can be beneficial when taking health problems into consideration. They will be addressed later in this article. One of the major recent enhancements to lift chairs is the addition of having a battery backup. This now comes standard on all lift chairs, and makes it so you are still able to use your chair even if the power is out. 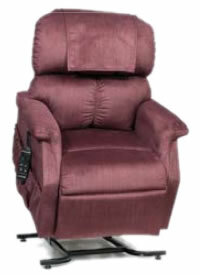 Many people look for swivel or rocker lift chairs and are disappointed to find that there aren’t any on the market. This is because a lift chair is designed for safety. In one of these chairs, someone would be able to rock or swivel while sitting in it, which would pose a safety risk. This is the reasoning behind not having rocker lift chairs. With all of the recent enhancements to lift chairs today, a lift chair is a great piece of furniture to have in your home. Whether you need the chair for a disability or just making it easier on yourself, having a lift chair in your home is always a good decision. You can call us and speak with one of our experts on the phone in order to find the perfect lift chair for your home at 1 (800) 257-1776.